"Groundhog Day" is a classic Bill Murray movie that shows just how ones life can be repeated over and over again until that person finds the secret to breaking the cycle. Each day is the same as the last. Every conversation is the same. Anticipating what is about to happen, or be said, and then throwing a wrench into the works is the only entertainment Bill Murray's character has for the longest time until he realizes that a significant change had to be made in himself. Tom Chamberland, our Tree Warden, is not like the Bill Murray's character, but he sure knows how it feels to be preaching the same thing over, and over for years, only to see his words not heeded, and his prophecies come true time and time again. Below is a newspaper article from December 17, 1996, not Halloween Weekend of 2011. When a town has an expert in it's midst, an expert that they hire, they need to take seriously the opinions for which they pay that expert, and take the information to the next step. If that had been done consistently, with a well drawn out plan between the town and National Grid, the power outages of last falls storm would have been minimal, and for significantly less than the week it was. 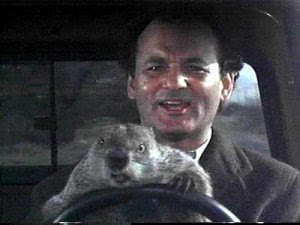 Listen to those that know more, and act accordingly, otherwise you may spend each day celebrating the groundhog. That same tree warden is looking for up to 18 million dollars for trails and "complete roads," helping to link up those trails. We can't do what we need to do, but huge amounts of time and money is spent to make the plans bigger and bigger and bigger. Remember, Wally, when you wrote about the sidewalks in Fiskdale being inadequate for handicap equipment? We didn't, and are told we still don't, have the money to fix them, - BUT we are looking for "complete roads", including Route 20 to get not only new sidewalks, on both sides, but to also accommodate either 4 foot bicycle lanes on both sides or separate trails along them - so kids can ride bicycles, not only to Tantasqua but to Burgess School as well! We are told that this would make Fiskdale "more livable," and "safer." Tell me it's just a nightmare, because someone sure has got to wake up quickly. The number may be 18 million but i thought that during the BOS meeting the other day the warden said we could potentially pay only 11k for a million dollars worth of trails. On topic now. I think the real work on the trees needs to be done by National Grid. They were saving money by not doing a damn thing for many many years. I heard some complaining on NPR this morning by residents of some metro boston town when the tree guys were out clearing the power line areas. They apparently didnt get to sit in the dark for 8 days like many of us did. Its amazing how fast the trees regenerate after some well done pruning. We could "potentially" see to it that, in the here and now, things that are needed to be done get done, rather than spending so much time, money and energy on the funding and implementation of the frightfully expensive forest fantasy project. EXPERT? Is this the same tree warden who condemned a McGilpin Road tree as hazardous when it turned out to be perfectly fine? Are you kidding? This is the same guy that wants the town to spend 18 millions bucks for trails. You can't walk down Route 20 with a baby carriage because of narrow sidewalks and telephone poles but your buddy wants to spend millions and millions on trails for a handful of people to feel good about themselves. No he's no expert, but he's your bud so I guess that makes it all ok? Yes, Tom planted those telephone poles in the middle of the sidewalk along Route 20. Tree Wardens do that sort of thing. They also ask for better and more tree trimming every year, and for the utilities to be responsible otherwise the lines will come down in a storm, and we'll loose power for a week. Sound familiar? I believe that was what this article was about. 1996 to 2011, and who knows how many years before that it was mentioned, and how many more in the future.